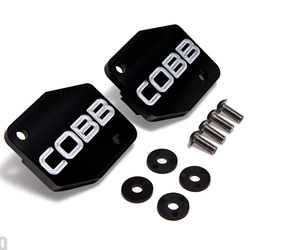 Find the best prices and save on your Cobb Tuning MAF Block-Off Plate for GTR from ModBargains.com. We offer FAST SHIPPING, Order Online or call 714-582-3330 to save today! The Cobb Tuning MAF Block-Off Plate is the perfect compliment to speed density tuning that can be provided by the AccessPORT. Speed Density tuned GTR's use the manifold pressure rather than the MAF sensor, which means the MAF could be removed to provide for less turbulence and improved performance. The COBB MAF Block-Off Plate is the easiest way to safely delete the MAF sensor for optimal performance and enhanced engine bay appearance. The plate is made from 6061 billet aluminum, and features an O-ring that seals it to prevent extra air from entering the engine. When seated the MAF plate sits flush with the MAF tube to provide for a smooth surface and prevent turbulence. Installation for the Cobb Nissan GTR MAF Block off plate is rated as a medium easy. You will need standard hand tools to complete this install, see below for a comprehensive installation guide.